When predators eat echinoids, they leave traces behind. 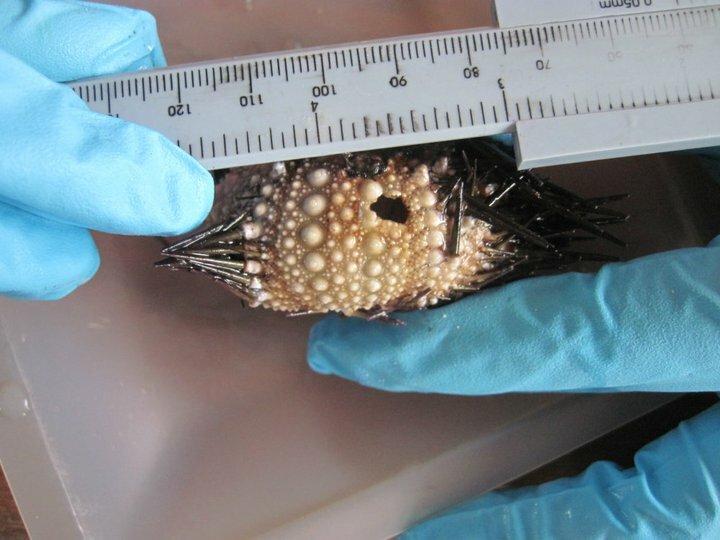 The hole in this sea urchin skeleton was made by a predatory Queen Helmet Conch. As is probably the case for a lot of paleontologists, Carrie Tyler’s interest in the field began with dinosaurs. “My mom read me dinosaur books and took me to museums and I really just fell in love with dinosaurs,” she says. But Tyler, an assistant professor in Miami University’s Department of Geology and Environmental Earth Science, grew up near the ocean, and so her interest eventually shifted from the creatures that trod prehistoric lands to the creatures that swam prehistoric seas. Specifically, Tyler is interested in echinoids, a class of animals that includes sea urchins, sand dollars, and sea biscuits and is well represented in the fossil record. She and her collaborator, Michal J. Kowalewski at the University of Florida, recently received a total of $343,000 from the National Science Foundation (NSF) to study the role predators may have played in the evolution of echinoids. Tyler says that understanding mechanisms like the interaction between predators and prey in ancient ecosystems can help us better anticipate what’s happening in our ecosystems today. The data Tyler is working with in this case are tooth marks, fractures, scars, and drill holes, visible on echinoid fossils. She and her team – which, in addition to Kowalewski, will eventually include a post-doctoral researcher and three Miami undergraduate students – will examine thousands of fossils, comparing marks they find to sets of established criteria to determine if those marks result from predation. If this sounds labor-intensive, Tyler says it is. But she and Kowalewski plan to make things a little easier by taking advantage of existing fossil collections at various museums. Tyler also hopes her team’s work on this project will make things a little easier for other researchers studying echinoids. While the existing sets of criteria for determining whether certain marks result from predation are general, one goal of the project is to redefine those criteria to apply specifically to echinoids. Tyler and her team will use these refined criteria to create a database other researchers can use as a global reference system for identifying marks that predators make on echinoids. Tyler says that because the database may help with future comparisons of echinoid predation with predation on other types of organisms, it will be useful to those studying modern ecosystems as well as to paleoecologists like her. And that’s part of why she loves her subfield, which also has intersections with statistics and computer science. It’s clear that Tyler embraces the diversity and need for adaptability inherent in her work, and that seems fitting for someone who studies evolution, which is, after all, a process driven by those very things. Photos courtesy of Carrie Tyler. This entry was posted in Research stories and tagged echinoids, ecology, evolution, fossils, geology, paleoecology, paleontology, predation, sand dollars, sea biscuits, sea urchins. Bookmark the permalink.